QR Inventory is targeted towards businesses who need to take assets and inventory under control, make it simple, affordable and accommodate their unique business needs and workflow. It is a web-bases asset and inventory management software with mobile inventory processing and look up. Using QR Inventory, you can track assets where they are: in the field, in a warehouse, on a job site, at the customer location, in a service van. You can utilize QR code and barcode scanning for faster and error-free inventory processing, without spending a dime on special hardware. Your employees can use their own smartphones (running iOS or Android) for processing assets and inventory transactions, checking item details or filling out relevant mobile forms. All information is submitted to the secure cloud and becomes available to all authorized devices / employees in real time. 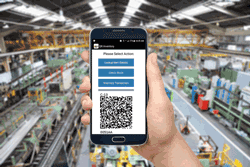 QR Inventory supports QR codes, regular UPC barcodes and NFC tags, giving you unmatched flexibility in automating inventory and asset management. You can easily customize QR Inventory for your business type / workflow by creating custom transaction types, defining what you want to track, and creating custom fields for assets and inventory via the web interface. Multiple options available for initial assets and inventory entry, inventory count ensures that your setup is fast and smooth.